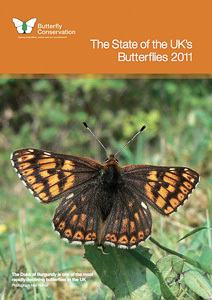 The State of the UK's Butterflies 2011, published by Butterfly Conservation, summarises the results of the "UK Butterfly Monitoring Scheme" and the "Butterflies for the New Millennium" (BNM) project. The former involves weekly butterfly recording from 1 April to 30 September, on an annual basis at 1000+ sites in Britain, and has enabled detailed analysis of species trends (90-100 sites are in Hampshire & Isle of Wight). The BNM project has provided detailed and up to date distribution maps for all British butterfly species based on over 6 million butterfly records submitted by members of the public. UK butterflies are still in decline, with 72% of species showing a 10-year decline at monitored sites, and 54% of species showing a contraction in their distribution range. Even so, with 46 resident butterfly species, Hampshire & Isle of Wight remains one of the best areas for butterflies in the whole of Britain. Habitat specialist butterflies are the ones showing the greatest decline, but overall numbers of our more common 'wider countryside' species are also showing signs of decline. Ongoing habitat loss and degradation is a particular concern, with changing land management practices & habitat fragmentation causing many species declines. The increased isolation of small colonies is of greatest concern for those species only able to disperse over very short distances. On a more positive note, 31 species showed increases in either their geographical range or population trends. In northern Britain, some species have shown a particularly marked northward extension of their range in response to climate warming, and in Hampshire & Isle of Wight the Clouded Yellow has become locally established in coastal areas and the Glanville Fritillary is increasing its range. Butterflies are extremely sensitive to environmental change, and are thus excellent indicators of the health of the countryside. They have been adopted by Government as one of the official indicators of biodiversity and the environment. The State of Britain's Larger Moths 2006 provides an overview of the status of moths in Britain, and has been followed by publication of the Provisional Atlas of the UK's Larger Moths, in 2010, with detailed distribution maps for all species. Common moth species are declining - two thirds (226 out of 337) of common moths showed pronounced population declines over the period 1968-2002 (Rothampstead light trap results). Such declines are likely to have knock-on effects up the food chain. Applying international (IUCN) criteria, 71 of the so-called 'common' moths would be classified as threatened, with 15 classed as 'Endangered' and 56 as 'Vulnerable'. Even the Cinnabar moth falls in the latter category by virtue of an 83% population decline over 35 years. South-east Britain (which includes Hampshire & Isle of Wight) shows a much higher proportion of species in decline (75%) compared with northern Britain (55%). Despite the overall declines, there are many new colonisers and species expanding their range in southern counties. Some species have increased considerably over recent decades, including Hampshire & Isle of Wight species such as Least Carpet (Idaea rusticata), Blair's Shoulder-knot (Lithophane leautieri), Satin Beauty (Deileptenia ribeata), Treble Brown Spot (Idaea trigeminata) and Peacock moth (Macaria notata). There are many things we can do as individuals to help. For example, you could leave a corner of your garden to grow wild with uncut grass. You could also plant food plants for the larvae of our native butterflies & moths. Easiest of all, you could plant a good range of nectar and pollen sources to give all year round food for butterflies, moths and other important pollinating insects. You can send in your butterfly and moth records to help us maintain an up to date an accurate picture of the status and distribution of all species in Hampshire & Isle of Wight. You can also get involved as a volunteer with practical conservation work parties held on Butterfly Conservation's nature reserves, or similar activities run by other organisations at important sites managed for the benefit of butterflies, moths and other wildlife.